Summary Two-bay Intel dual-core Celeron-powered SATA NAS with dual Gigabit LAN, USB 3.0 and HDMI port. Also can be used as USB 3.0 DAS. Summary Four-bay Intel dual-core Celeron-powered SATA NAS with dual Gigabit LAN, USB 3.0 and HDMI port. Also can be used as USB 3.0 DAS. QNAP's TS-x51 series is a mainstay of its Home and SOHO product family. We reviewed the original TS-x51 series around two years ago. Since then, QNAP followed up with the TS-x51+, based on a 2 GHz quad-core Intel Celeron J1900 processor, which we didn't review. This brings us to the TS-x51A family we're looking at today. As in the past, we had QNAP send the four-bay TS-451A-4G, which we loaded with only two drives to generate data for the TS-251A. Both models use the same Intel N3060 Celeron dual core processor, are also available in a 2 GB versions (TS-251A-2G and TS-451A-2G) and can be upgraded to 8 GB of RAM total. The big innovation the A series brings is what QNAP has dubbed a USB QuickAccess port. The blurb below snatched from the A series product page provides the gist of the feature. Essentially, you get a USB port that looks, behaves and performs like a Gigabit Ethernet port, but using USB 3.0, not Ethernet. This provides the convenience of direct-attach storage, but without DAS performance. The chart below shows a comparison between the original TS-x51 series and the new TS-x51A models. Though the case sizes and configuration remain the same, the new models have a teal colored strip along the left side of the front panel. The callouts below show the front and rear panel layouts for the TS-x51A models. The front panel now includes an SD card reader as well as the USB QuickAccess port. The rear panel now includes a 3.5mm microphone jack. This will allow audio to be ported to either the 3.5mm output jack or through the HDMI port and enables downloadable programs such as OceanKTV - a karaoke app that runs on your QNAP TS-x51A NAS. On the TS-x51A models, all three USB ports are USB 3.0. The original TS-x51 models had two USB 2.0 ports and a single USB 3.0 port. TS-451A disassembly is similar to the TS-451; you remove the cover, remove the screws securing the drive cage and backplane and lift it off. I wasn't able to find any information on how to upgrade RAM, but this is how you get to the RAM, since it's not accessible otherwise. Both the TS-251A and TS-451A are powered by a 1.6 GHz Intel Celeron N3060 dual-core processor, sitting under the heatsink in the photo below. Two Kingston DDR3L 2 GB SoDIMMs are used for memory. I couldn't find the flash DoM module QNAP typically uses. The TS-451A's drive backplane holds a single Asmedia ASM1062 PCIe 2 port SATA controller, which is probably absent on the two-bay TS-251A. The USB QuickAccess port is generated by a Realtek RTL8153 Integrated 10/100/1000M Ethernet Controller for USB Applications. A Realtek RTL8111E Gigabit Ethernet controller sits close by it, so I'm guessing it's also involved in the QuickAccess port's function. Table 1 summarizes key components for the TS-251A / TS-451A with those for the non-A versions. The TS-x51A runs the latest version of QNAP's operating system - QTS 4.2.2. We did an in-depth review of QTS 4.1 about the same time as the original TS-x51 models were reviewed. QNAP provides a good overview of the features of QTS 4.2. QNAP's site also provides a link to a 124-page brochure that details all of the features of QTS 4.2.2. QTS 4.2 features an improved user interface. Below are a couple of screenshots that show the landing page, the control panel and the resource monitor. QNAP provides a live demo, so you can connect to a demo server and explore features (read-only) yourself. Other new features include USB QuickAccess, hardware-assisted AES encryption, and real-time 4K and 1080p transcoding. QTS 4.2.2 Build 20160812 firmware was loaded onto a TS-451A-4G and performance tests were run using the Revision 5 NAS test process. Since the TS-251A-4G uses the same processor, RAM and Ethernet components, all testing was done on the TS-451A-4G. The TS-451A-4G tests used four drives configured in single RAID 0, 5 and 10 volumes. The TS-251A-4G tests used two drives in single RAID 0 and 1 volumes. All tests were run using Western Digital Red 1 TB (WD10EFRX) drives (x2 / x4 SNB supplied). Power consumption with four drives was 27 W with all drives spun up, dropping to 13 W with all spun down. Spin up / down consumption for two drives was 16 W and 10 W, respectively. Noise level with both two and four drives was low, with a bit more drive noise with four drives. The fan was virtually silent, even during testing. The composite image below shows how the TS-251A-4G and the TS-451A-4G compare to other products for File Copy Write Performance. The File Copy Write test for the two-bay test TS-251A-4G was 100.4 MB/s and the TS-451A-4G turned in 102.6 MB/s. Note that quite a few NASes at the top of both charts are clustered around 110 MB/s. That's about the maximum throughput that you can achieve with single client Gigabit Ethernet testing. For ranking purposes, we consider performance within 5% as equal. However, both of the QNAP TS-x25-4G tests results were outside of the 5% threshold, so this would be an initial indication that write performance could lower the overall Total NAS ranking score. For the two drive comparison, I chose the original QNAP TS-251 (an obvious choice) and the ASUSTOR AS6102T. The ASUSTOR AS6102T has a similar Intel Braswell N3050 Celeron dual core processor that also supports hardware assisted 256 bit AES Encryption as well as 4K video. And, as of publication, the ASUSTOR was priced $2 less. The benchmark summaries below show all three NASes. File copy write and read performance was above 100 MB/s for both RAID 0 and RAID 1 for all products except for the 94.3 MB/s File Copy Read performance turned in by the TS-251. Interestingly, the TS-251A-4G's File Copy performance slightly trailed the TS-251's performance except for File Copy Read. For USB 3 Backup (all formats), the TS-251A-4G held a significant edge over the AS6102T and slightly edged out its TS-251 sibling except for EXT format where it tied at 91.1 MB/s. For network backup, the TS-251A-4G trailed both of the other two NASes but had similar results compared to the TS-251. For the iSCSI Write test, both of the QNAP NASes outperformed the ASUSTOR. For the iSCSI Read tests, the TS-251A-4G had the lowest score of the three products compared. The NAS Ranker, filtered for RAID 1 and Revision 5 testing and sorted by ascending price shows that the QNAP TS-251A-4G ranked #10. Looking at the chart, you can see that there are five NASes that were cheaper than the TS-251A-4G, but had better Total NAS rankings. (#6 ASUSTOR AS6102, #2 Synology DS216+, #8 NETGEAR RN202, #4 Synology DS216 and #9 QNAP TS-251). The chart below shows the individual and category scores for the same three NASes used in the 2 drive benchmark summaries above. 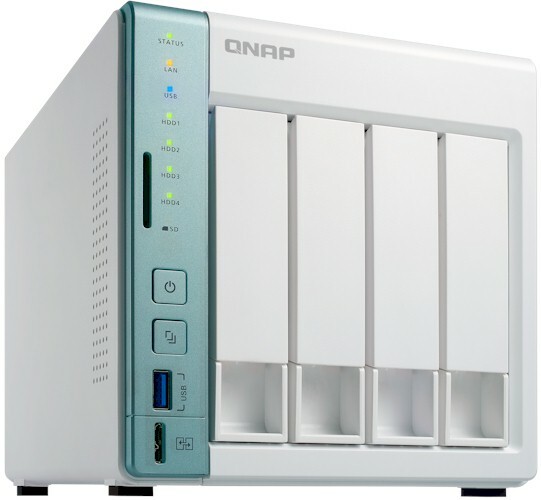 The QNAP TS-251A-4G earned a #10 ranking. It didn't win in any category as compared to the other two NASes. Its best performance was a tie for #4 in the Video category. It did hold a slight edge over its TS-251 sibling for both the Write and Read benchmarks. For four drive NAS comparisons, I included the original TS-451 as well as the ASUSTOR AS5004T. I included the AS5004T it has a price point that is similar to that of the TS-451A-4G and is also based on a dual-core Intel Celeron processor. However, the processor in the ASUSTOR NAS is an earlier generation J1800. The chart below compares the three. File copy Write and File Copy Read results were consistent across all RAID levels (RAID 0, 5, & 10) for all NASes with the exception of the relatively low performance of RAID 10 File Copy Read performance on the TS-451A-4G. RAID 5 NASPT File Copy Read results were lower for both of the QNAP NASes, and as we'll see from the category performance chart below, helped to lower the ranking for the Read category. The ASUSTOR AS5004T outperformed both of the QNAP NASes for both iSCSI read and iSCSI write tests. As with the RAID1 rankings above, I used the NAS Ranker to filter for RAID 5 class products, test method 5 and sorted by ascending price. Since two of our three NASes used in the four-bay comparison didn't appear on the first page I created a composite image showing the results in a two-column format. Looking at the Ranker subcategories, the results were pretty much as expected. 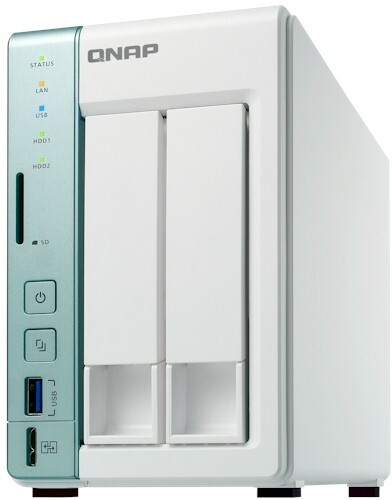 For Write Benchmarks, the QNAP TS451 and TS-451A-4G tied for #13, just behind the AS5004T at #12. But for the Read Benchmarks, both QNAP NASes took a hit - largely because of their low rankings for RAID 5 NASPT File Copy Read results. The original QNAP TS-451 actually outperformed the TS-451A-4G in Mixed Read, Video and Backup. Both QNAP NASes had #5 category rankings for iSCSI - just behind the #3 ranked AS5004T. This feature takes a little figuring out. Although you can use it, you don't need to run the Qfinder Pro app to use USB QuickAccess. However, with its default settings, you won't find it via Windows Network browser, nor will it appear as a USB drive in Windows Explorer. The reason for the latter is that the QuickAccess drive isn't a USB device, it's a network device. If you find your way to the NAS Network and Virtual Switch settings, you'll see a new USB QuickAccess tab. The screen below doesn't show the original IP address settings, which were not in my LAN's 10.168.3.X subnet. Once I assigned an unused IP address in my subnet, I was able to connect to the NAS using that new QuickAccess IP address. I also ended up installing Realtek's USB QuickAccess driver on the Windows 8 test machine to get it to work. QuickAccess driver installers for Windows, Mac OS and Linux are available on the TS-251A and TS-451A Support pages under the Firmware section. The QuickAccess connection is for all intents and purposes, a Gigabit Ethernet connection that works through the 251A and 451A's front-panel USB 3.0 Micro-B port. It's not just for storage access; you can log into the administration interface and manage the NAS, too. If you also have Ethernet connected, you'll be able to access the NAS via that IP address also. When I say QuickAccess acts like a Gigabit Ethernet connection, that's true for performance, too. To test QuickAccess performance I ran the same Windows robocopy filecopy test run as part of the normal NAS test suite. Results using a RAID 5 volume were virtually identical to Ethernet-connected results. I measured 109.19 MB/s write and 101.48 MB/s read using QuickAccess and 109.74 MB/s write and 102.77 MB/s read using Ethernet. The new QNAP TS-x51A series is a welcome product refresh that adds some unique features not seen on other NASes - at least not yet. The ability to connect a TS-x51 NAS as a direct attached storage using USB QuickConnect is a feature that I'm guessing that will appeal to a lot of people. Who wouldn't want terabytes of fault tolerant storage attached directly to their computer? And while you can argue whether using your NAS for karaoke is a good or bad thing, the microphone input could be useful for other applications as well. Unfortunately, the TS-x51A series seems to give up some performance even with more RAM than the original TS-x51's. For two-bay NASes, the TS-251 ranks #9, just edging out the TS-251A-4G. But the TS-251 is more than $100 cheaper than the new model. In between the price points of the two models, there is some very stiff competition including the #2 ranked Synology DS216+, and the #4 ranked Synology DS216. For four-bay NASes, the story is much the same. The original TS-451 ranks #13 and the TS-451A-4G ranks #17. Originally, I chose to include the ASUSTOR AS5004T for comparison since it was so close in price to the TS-451A-4G. But looking at the charts, the ASUSTOR AS6104T, the four-bay version of the AS6102T that we used for the two-bay comparisons, is an even better bargain. It uses an N3050 Celeron processor and offers the same hardware-assisted encryption as the TS-451A-4G. QNAP's marketing materials tout the TS-x51A NASes have a hardware encryption engine that excels at reading and writing encrypted data with little performance impact. We don't test encrypted volume performance, but we'll pass along QNAP's results below. Depending on how you plan to use your NAS, the TS-x51A's new features, including USB QuickAccess, 4K real-time video transcoding, hardware assisted encryption and, yes, even karaoke, may be a compelling mix that will tilt the balance in favor of the new TS-x51A NASes. But there are five two-bay and five four-bay NASes that offer more performance for less money.